The Green Party has released a campaign poster that mocks the four male party leaders who could take part in the general election debates. 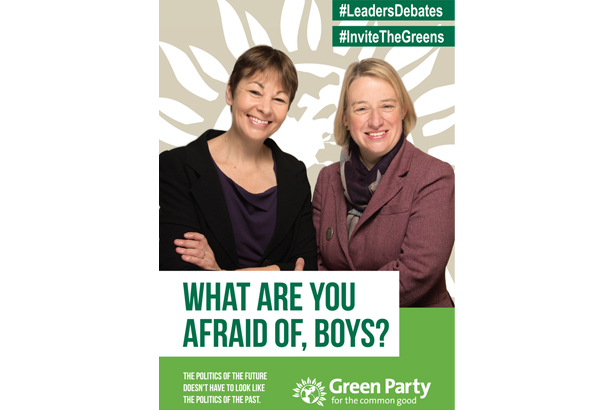 The poster features Green Party MP Caroline Lucas and party leader Natalie Bennett with broad smiles above the caption: "What are you afraid of, boys?" The poster is the Green Party’s attempt to challenge broadcasters to allow the Green Party to take part in the leadership debates. Currently, David Cameron, Ed Miliband, Nick Clegg and Nigel Farage have been invited to appear in the debates in the run up to the election but the Green Party’s leader has not. Ofcom, the broadcasting regulator, has previously said the Green Party is not prominent enough in British politics to qualify for airtime alongside the other leaders, despite its rapidly rising membership. Jonathan Kent, from the PR firm Black Coffee, which is working with the Greens, devised the poster’s tagline. He told PRWeek the poster was an attempt to highlight the similarity of the backgrounds of the leaders who had been asked to take part in the prospective debates. He said their background was public school, middle class, forty-something men, while the three parties that have been excluded – the Greens, Plaid Cymru and the SNP – are all led by women. "We came up with the tagline because it seems silly the way women are told to shut up, not only in politics but in life. The Green Party naturally tends to favour women and it is shaped by female values so this poster embodies its spirit and values." An earlier version of the poster featured Lucas and Bennett gagged but this image was abandoned. Kent added: "This version of the poster is very disarming and it is not an aggressive challenge but it is a teasing, even shaming one." Kent said the party hoped to move off personality-centred issues of "who you would most like to have round for dinner?" and on to serious policy areas. The party said its comms strategy over the coming months would be looking to the future rather than the past and would make the case that austerity is not working.